Great news. 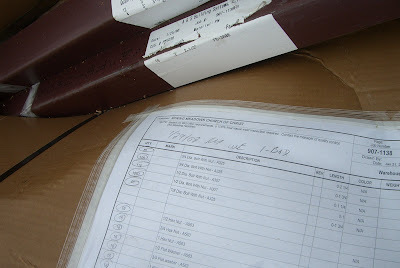 The building structure, form arrived today. Here are some pictures of it being unloaded and of it sitting and doing what we all are getting better at than we wish...waiting for the fire marshal :). As this process continues to work toward completion you need to know that all involved believe there is a light at the end of the tunnel! We hope this beams will be rising toward the heavens before too long. Keep on praying. P.S. You'll want to trust me on the pics and not go out there - because of the good rains we've had lately - it's a mess!!! !